Not surprisingly, I’ve enjoyed a bit of quiet time following my return home to be with my wife, decompress, and spend time with friends. Before I got here, though, I had several wonderful days in London. Three research endeavors long in the making came to fruition for me. Several British museums have impressive collections of Ugandan musical instruments, some of them with considerable historical significance. 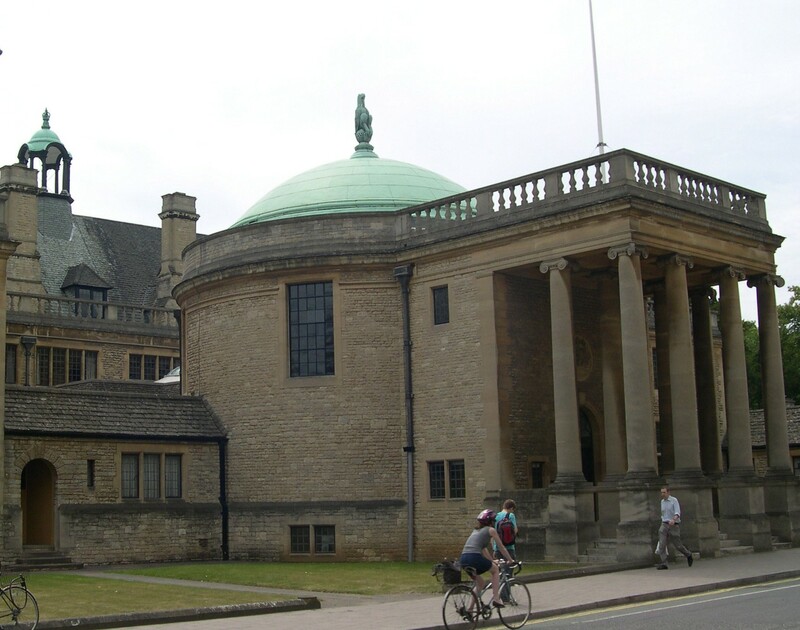 I got a chance to see objects relevant to my research from collections at the Horniman Free Museum and the British Museum in London, and the Pitt-Rivers Museum of Anthropology and World Archaeology at Oxford University. Having flown into London on Tuesday afternoon from Uganda, I began on Wednesday morning with the Study Collections Center for the Horniman. The staff there had generously pulled about a dozen instruments from their shelves that I selected from a list prior to arrival. I went from there to the Hackney area for a visit to the British Museum’s similar offsite facility. Again, there were only a handful of the instruments I asked to see that directly related to my work in Buganda and Busoga. Others, however, piqued old interests from my master’s thesis on possession music in the broader Interlacustrine (i.e. between the lakes) region of East Africa. This was very exciting because the objects took on new significance for me after having seen so many rituals since that research. 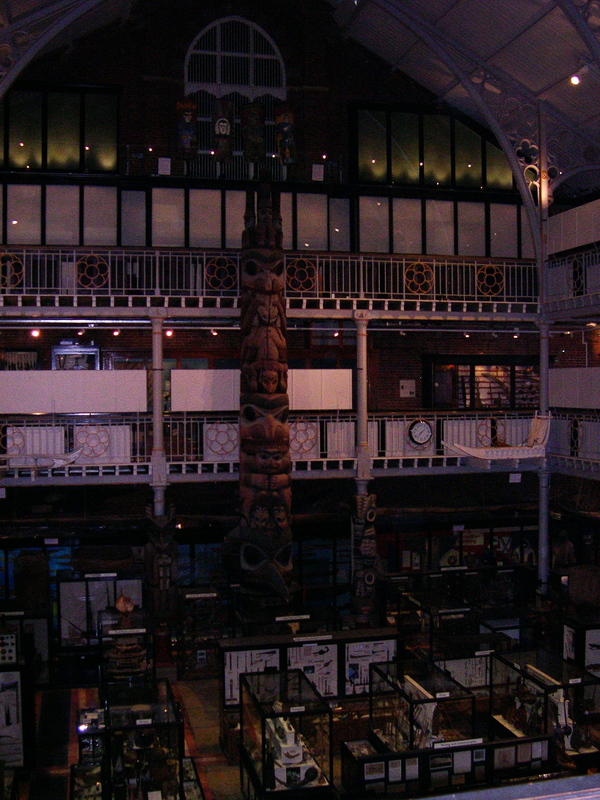 On Thursday, I made the trek up to Oxford University to the Pitt-Rivers Museum. Right off the train, I got directions from a student who was directing prospective students and their parents to various destinations. 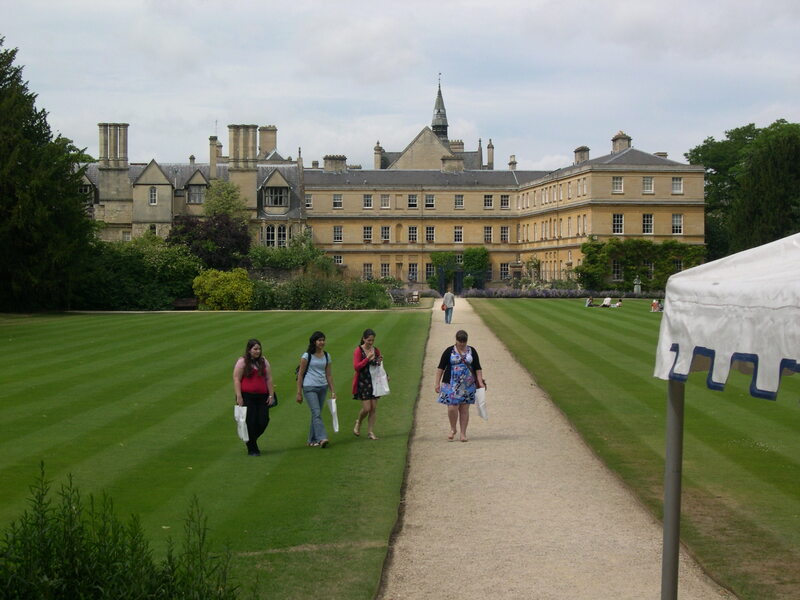 Although I cannot include my research photographs here (the copyrights belong to these museums), I must include a few of the colleges at Oxford. 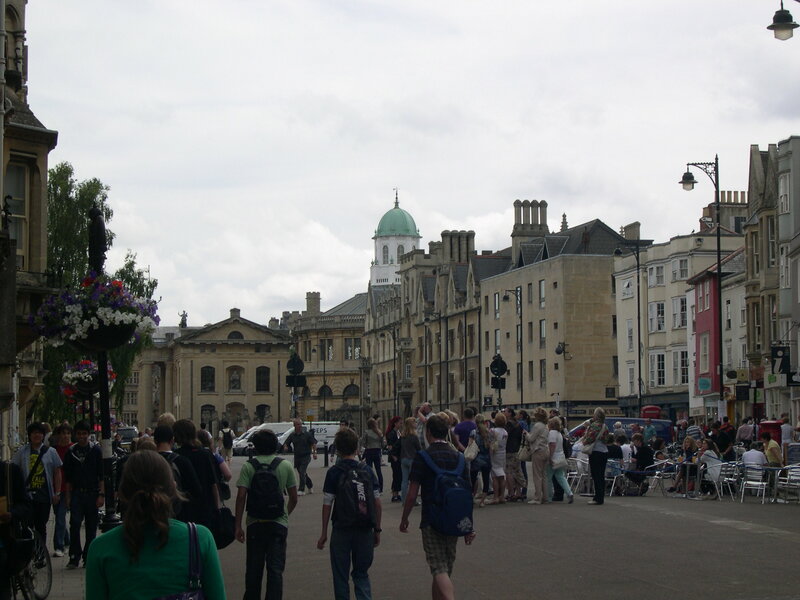 The whole place was buzzing with the touristy atmospohere of people walking on the streets (no doubt much to the chagrin of local drivers, who have a hard enough time parking here anyway) and taking tours of the various colleges. Here’s beautiful Trinity College, which I passed by on my way to the way to the museum. When classes are in session, crossing the lawn like this would, for most people, be met swiftly with bulldogs and police with batons. I guess they’re more lenient on visiting days. 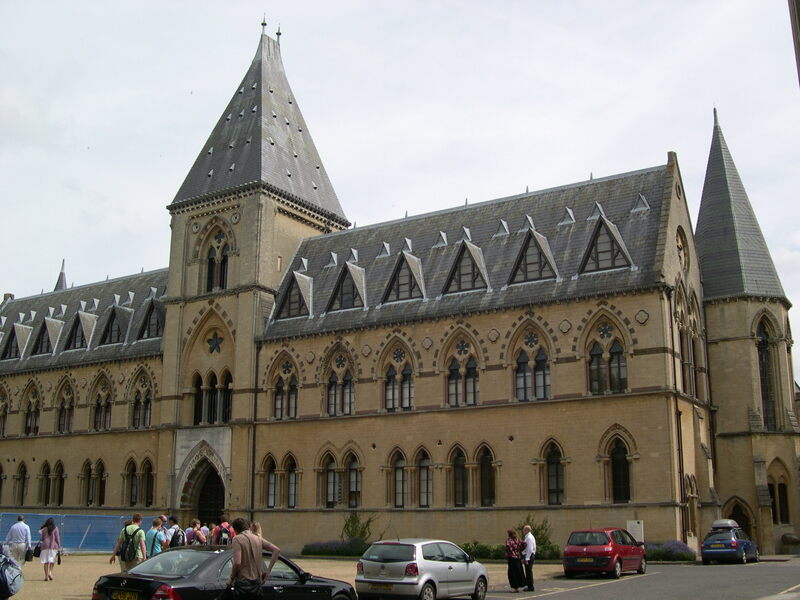 Here’s the building that houses the Oxford Natural History Museum and the Pitt-Rivers Collection. followed by his even larger friend, T-Rex. 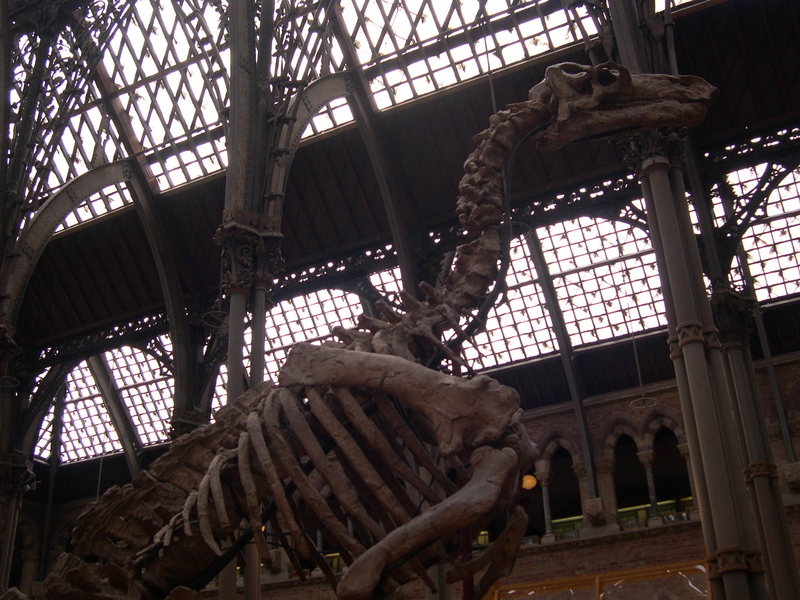 Just adjacent to them were the Oxford Dodo and the rabbit of Alice in Wonderland fame. (Dork-out time.) It was almost sad to leave all of this in favor of an upstairs examination space where I would view some of the objects in closer detail, but I got over that when I got there. Through several secure doors and a final attractive sliding glass door into a newly remodeled ultra-modern study facility, my selections awaited under near-perfect natural light from the ceiling windows above. There was a royal drum from Bunyoro along with several ritual rattling idiophones from Bunyoro and Ankole in Western Uganda. (Seriously, it only gets dorkier from here, but I can’t resist.) I had cited drawings of these rattles in my master’s thesis, but I had never seen them in use, on video, in pictures, or in person. Even more exciting was the realization that many of these objects had been acquired for the museum by none other than Reverend John Roscoe, an important early twentieth century missionary ethnographer of Uganda (the click-through on that one is worth a chuckle at some of his other “discoveries”). Even his original letters about the objects to Henry Balfour, who was in 1921 and for a long time the curator of the Pitt-Rivers, were there with typed transcriptions! 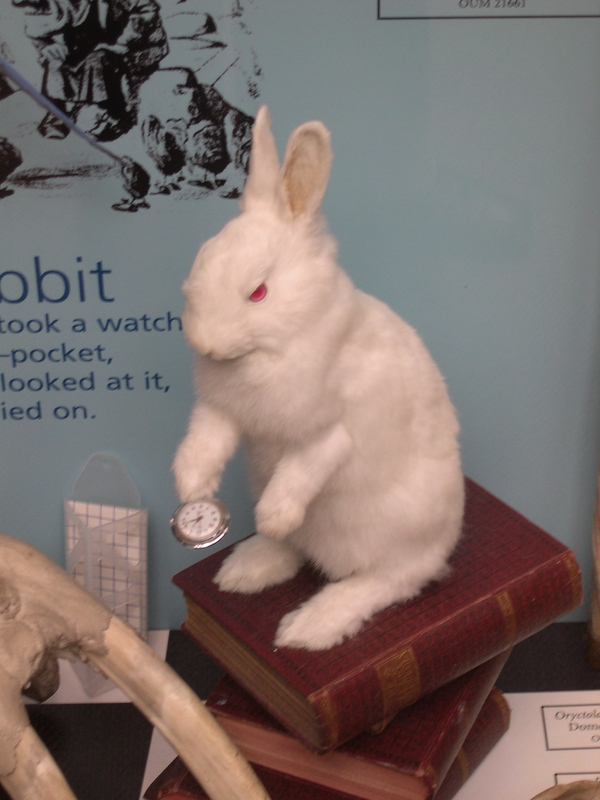 What else should I expect for the museum that houses all of Radcliffe-Brown’s fieldnotes and symbols of Lewis Carroll’s Alice? After photographing and taking notes on these instruments, we headed down to the music storage area to see some more. Fun as it was to examine these materials in the comfort of a well-lit study facility with large tables, it was equally fun to go into this dungeon of storage to dig out a few more treasures. Royal trumpets, ritual bells and horns awaited me there. When we finished, I had a chance to go out on the display floor and poke around a bit. It’s quite 19th or early 20th century in its presentation. This museum and the research that fueled it for a long time were founded upon the principle that if we could collect objects from various cultures, they might be able to tell us something about the various stages of evolution in which those cultures simultaneously existed. Phrenology and unilineal evolution are dead now, but the organizaitonal method remains: these objects are grouped not by culture or region, but by type. Out the back door of the museum and a short jaunt around the corner lies Rhodes hall (yes, that Rhodes). All my research wrapped up, I decided it was time to enjoy some good old English fish ‘n’ chips with a pint. I purposely got off the beaten path, where this simple fare all too often gets exoticized to the tune of 10£ or more. I found a pub with outdoor seating on Turl street, where I got my wish, along with the first beer I’ve had in months that wasn’t a lager. 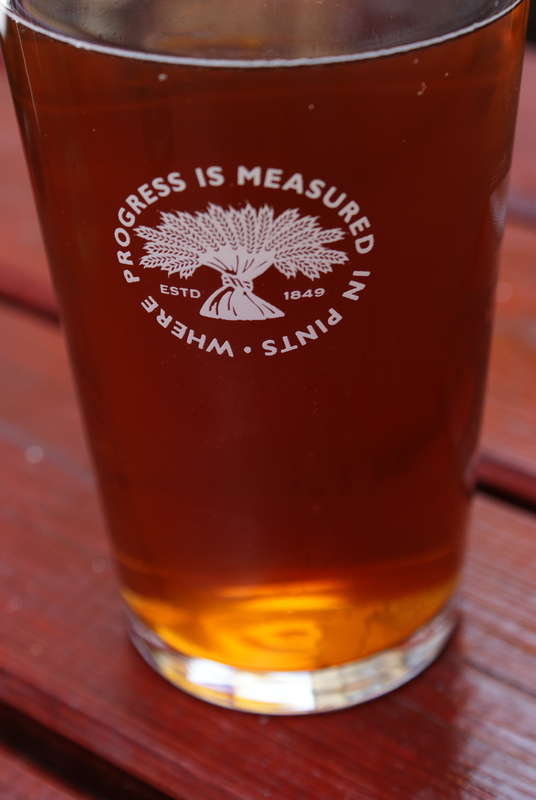 There I got exactly the experience I was looking for: Old Hookey Ale. Your comment about the photo copyrights belonging to the museum is a great example of intellectual property insanity. What a load — I’m assuming that was one of the conditions of accessing artifacts that weren’t currently on exhibit? Or were there also signs up saying you couldn’t take photos in the exhibition halls? Oh, and God Save The Queen. Cheers. Hmmm, so true. While some of the items I examined were acquired by explorers or researchers and given to or purchased by the museum, others should really be re-patriated. Still, it does take considerable resources to acquire, store, maintain, restore, and protect those things. I understand their desire to protect their resources, but there are ways to do it that make more sense than copyright.